The origin of the pop-up store. 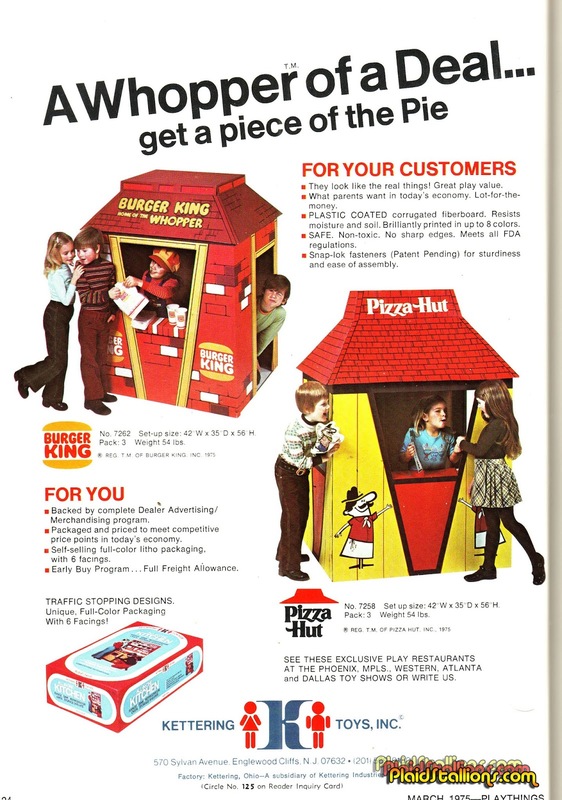 As you see in the ad- for a time, in the 1970s + 1980s, clerks at Burger King, and at some other fast food places- wore big, puffy, flat cap -type caps. GIRL: "Can I have some of your onion rings?" BOY: "Why didn't you just order your own onion rings? You *always* do this!" LINE COOK: (thinking) This job stays minimum wage forever? CLERK: "Show me on this menu where it says "stuffed crust," lady. Here's your nickel back." GIRL: "I'm telling you: it's gonna be HUGE in twenty years!" BOY: "If this mascot is hawking pizzas with cheese stuffed in the crusts in twenty years, I'm naming my future band Nickelback!" Low-paying job toys were fairly common long before this. Old enough to remember when toy service stations were a hot item. They were made of metal and the fancier ones had a ramp to the roof for some reason. Remco made a little car wash, and Sears had a parking structure with an elevator. There were also toy cash registers, toy telephone switchboards, toy soda fountain dispensers, and tons of stuff for little girls to play housewife. True, there were toys for better careers: Construction, medicine, law enforcement, aviation, and whatever it was Ken did (the catalogs would show him by a pink sports car next to Barbie's dream house, wearing a shiny tux. Come to think of it, what did Barbie do that paid for all those clothes and accessories?). I got the Pizza Hut Oven for Christmas one year.I liked the idea of my own cooking appliance,but baking a 3 inch round pizza with a light bulb was a challenge with a very small payoff.It was, however, a gateway to a Joe Namath Presto Burger machine,which worked like a modern day Panini Press.Early in my adulthood,I began working at local markets and pizzerias as a cook,and while I was successful(and in demand)The pressures involved with that kind of job drove me to give it up and take a construction apprenticeship.I still love to cook,just on my own terms.Long story short,I would have liked either one of these little cardboard buildings to while out my childhood days making little pizzas,burgers and grilled cheese in them. Ha, yes. When I was like 5 (in the early 2000's, mind you) I had a McDonald's one of these. Well, it was a lot more expensive. But yeah, I've seen people make fun of the idea but to be honest, when we were little, little kids we though any job was cool. "What parents want in today's economy..."??? Doesn't say much for the job market in 1975. I had the Burger King one. My mother has an old Christmas morning photo of my brother, sister, and me playing in it.